Think you're not an artist? You might be surprised. Does anything in this list sound familiar? You are not content to make a plain box. You have to paint it and attach a pretty origami flower. 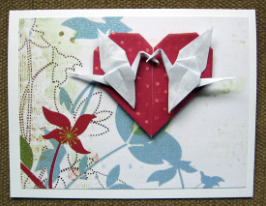 You make elaborate origami cards and gifts for your friends and relatives. You are compelled to tear restaurant placemats into squares and fold things for everyone at the table. You leave a crane for the waitress along with the tip. Sometimes you even fold the tip money. Your closets are overflowing with containers of your folded models, many of them experimental new designs gone awry, but you want to save them ...just in case. 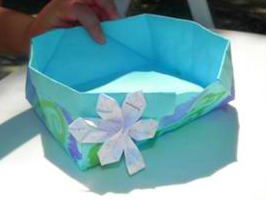 You are seriously thinking about making your own origami paper from scratch. 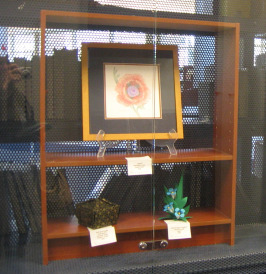 Your origami is on display in an art exhibition ...behind glass no less. Until recently, I didn't consider my origami to be "art," and I certainly didn't consider myself to be an artist. I couldn't draw anything more than a stick figure if my life depended on it. For me, the attraction of origami is the geometry and the transformation of the paper from two-dimensional to three-dimensional. Then I began doing workshops at our local specialty art-supply store, Artist and Display, where I had purchased origami paper for many years. By spending more time there, I began getting acquainted with many local artists and gaining more exposure to their work and materials. I discovered I really like artists. Artists are fun to hang out with. You'll rarely hear terms like "shareholder value," "return on investment," or "speed to market" when you talk to artists. They come from a happier, more beautiful place. The really great and amazing thing is that they welcomed me as a fellow artist. They taught me that what I do is art and that it's worthy of being shared and displayed. Consider joining your local art guild. You'll make a bunch of interesting, new friends and maybe discover new techniques and materials you can incorporate into your folding.